In the summer you can recognize the different kinds of trees from the shape and size of their leaves. When trees drop their leaves in the winter months you can use different characteristics such as bud shape, leaf arrangement, bark, and overall growth pattern to identify tree species. 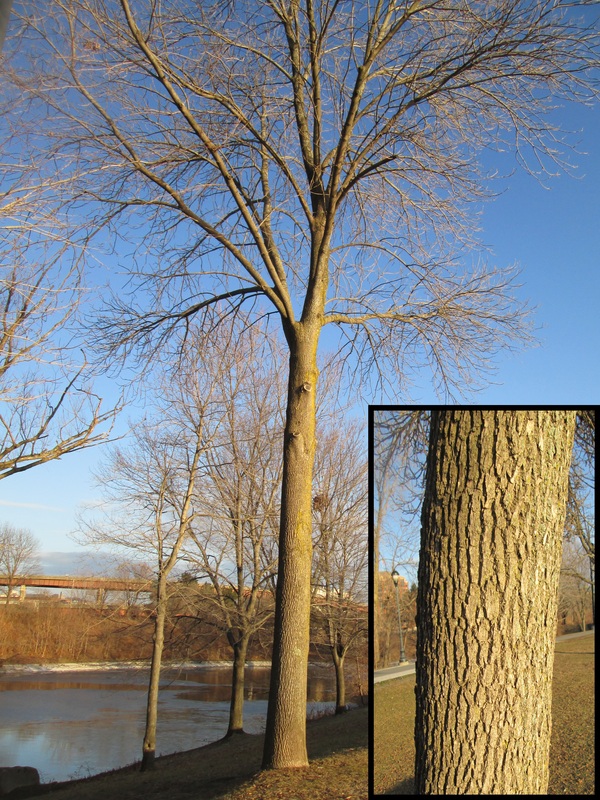 As an example, let’s learn how you can identify Red Maple, Green Ash, and Black Walnut. First let’s learn some basic terms! We will start with leaf or bud arrangement on the stem which will be either “alternate” or “opposite”. 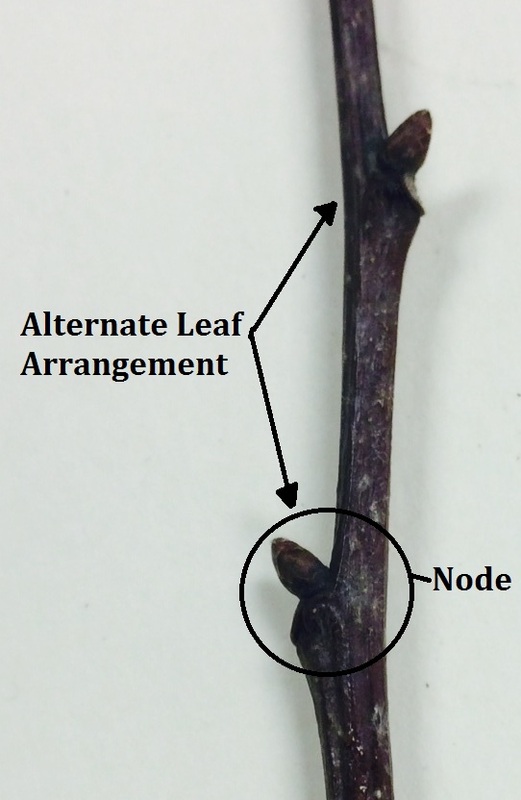 The buds are where next year’s leaves will emerge from and the nodes are where the leaf or bud attaches to the stem. 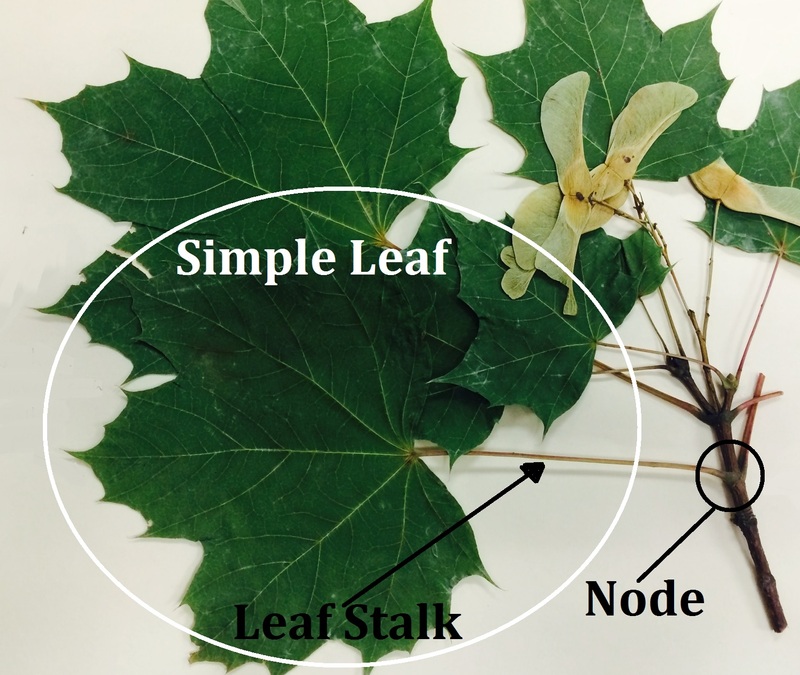 Alternate leaf arrangement is when there is one leaf per node. 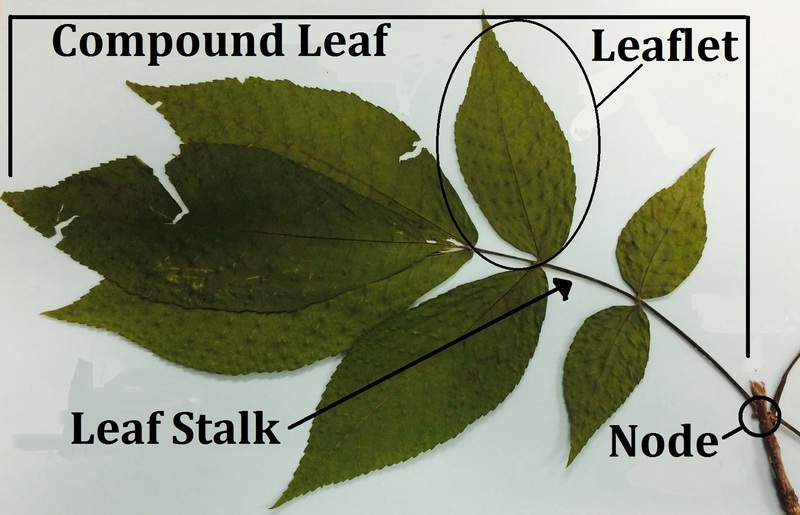 Opposite leaf arrangement is when there are leaves per node (across from one another). The leaf scar is another important characteristic to look at. This is where the leaf fell off the stem during autumn. 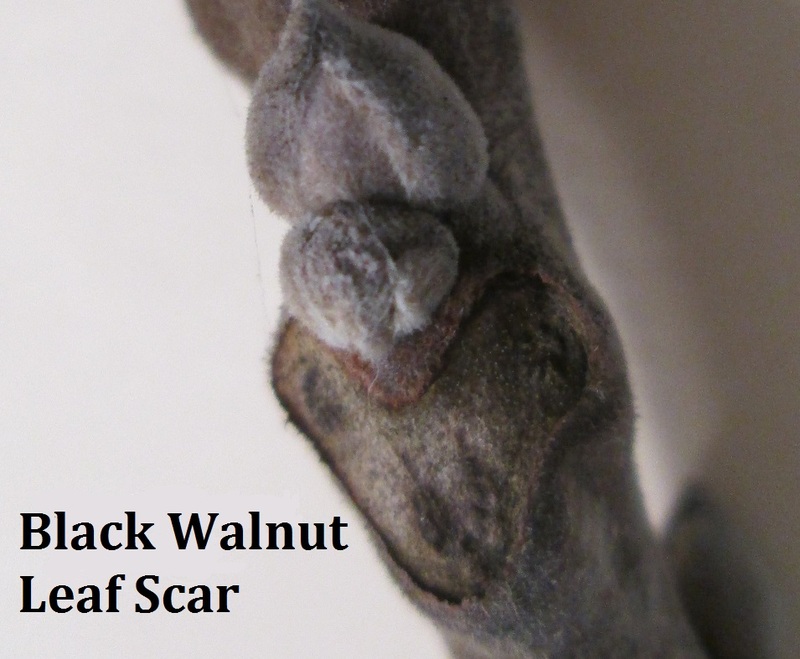 Some trees, like the Black Walnut, have very distinctive leaf scars. Their leaf scar resembles a fuzzy smiley face! Now we area ready to learn some tree species! Green ash is typically very straight with a single trunk. The branches usually grow from the top of the tree, not from the sides. The bark is greyish in color with thin furrowed ridges forming an intersecting diamond pattern. Green ash is found growing in lowland areas. 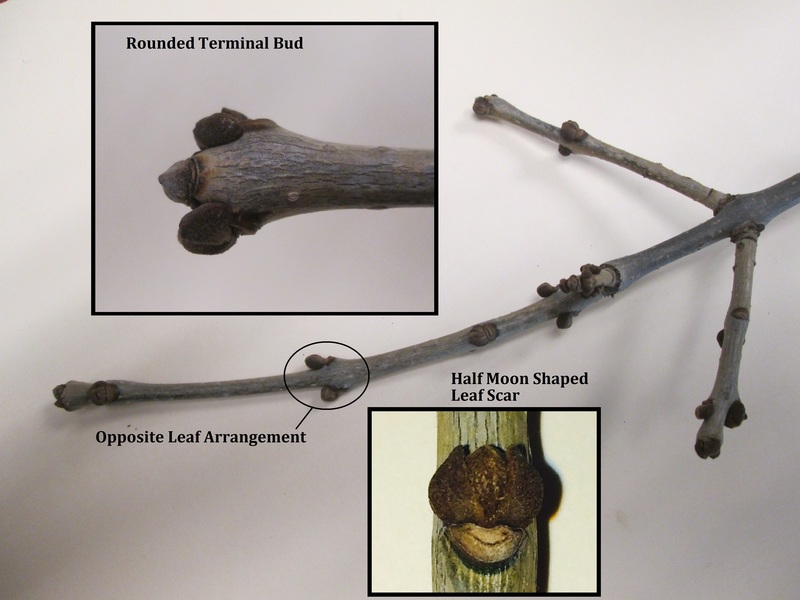 Now we will look at the characteristics of the twig: Notice how the leaf buds are rounded and in an opposite arrangement at the leaf node. The leaf scar is shaped like a half moon or an upside-down “D”. The stem is grey in color and the buds are a dark greyish-brown. There is one bud at the apex, or tip of the stem. 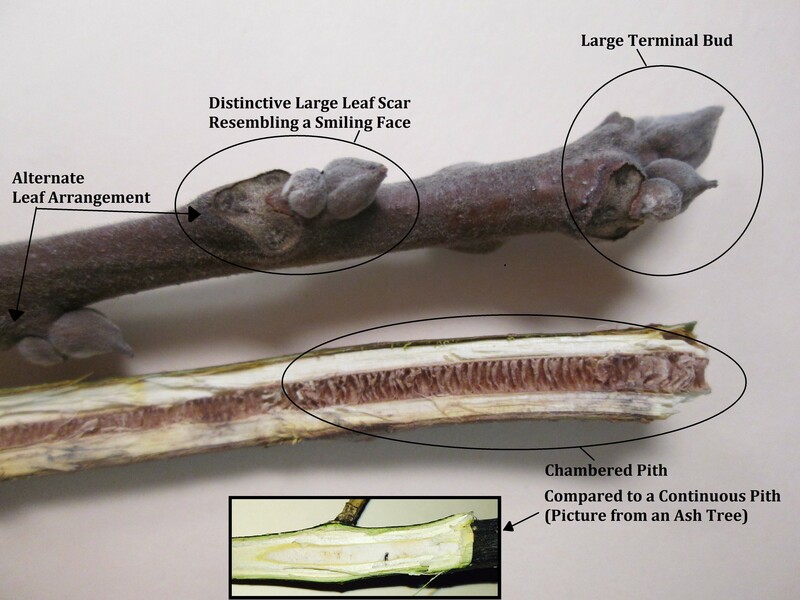 White ash is very similar, but the leaf scar has a v-shaped notch on the top and the twigs tend to be gray-green. Red maples vary in growth pattern. They may grow with a straight trunk or multi branched; like the tree in this picture. Bark is greyish-brown with a thin flaky appearance. 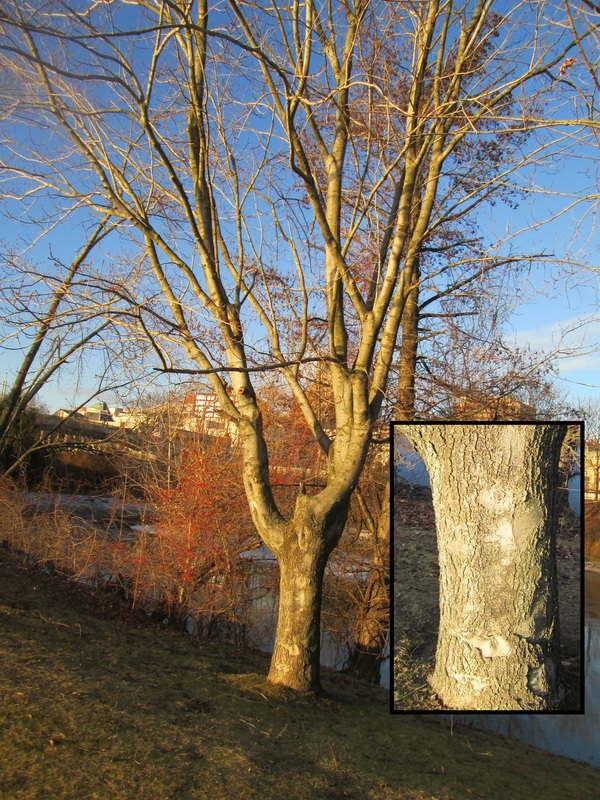 Younger trees look smooth, the “plating” or flaky appearance, increases with age. Red maples often grow in swamps but are common in uplands too. Red maples have opposite leaf arrangement. Flower buds usually form high up in the canopy and not on lower branches. Once the flowers have bloomed, leaves will replace them on the same node. 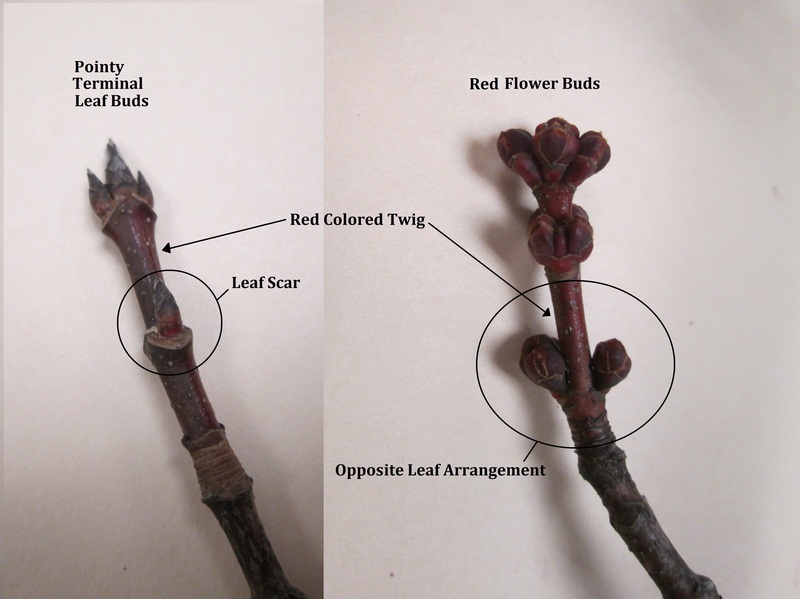 The leaf and flower buds are reddish in color, as is the stem itself. The leaf buds are pointed and there is one terminal leaf bud. Black walnut trees have a wide branching growth pattern. The bark is dark brown, becoming darker with age. The bark has deeper furrowed ridges than ash, with looser intersecting ridges. Also evident is the dropped compound leaf stalks* underneath the tree. 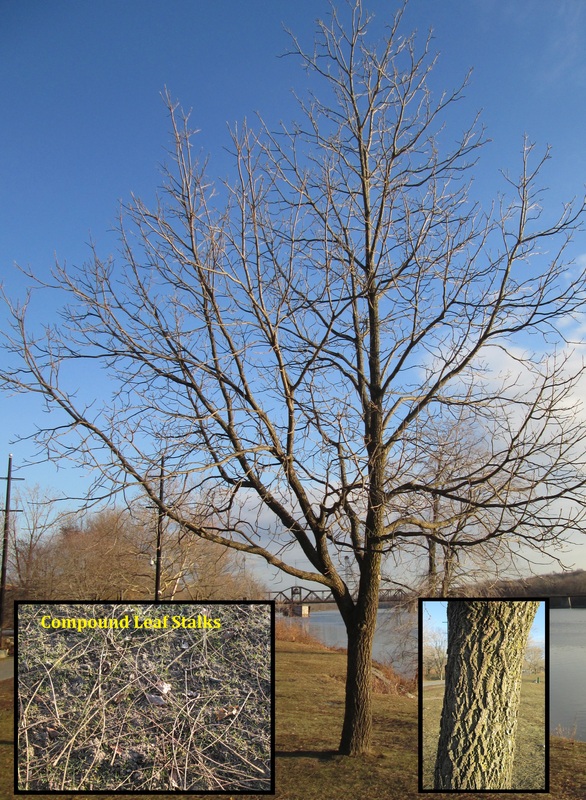 Black walnut trees are found growing in well drained, lowland areas. *A compound leaf (such as on ash and walnut) has multiple leaflets on the leaf stalk. See below. 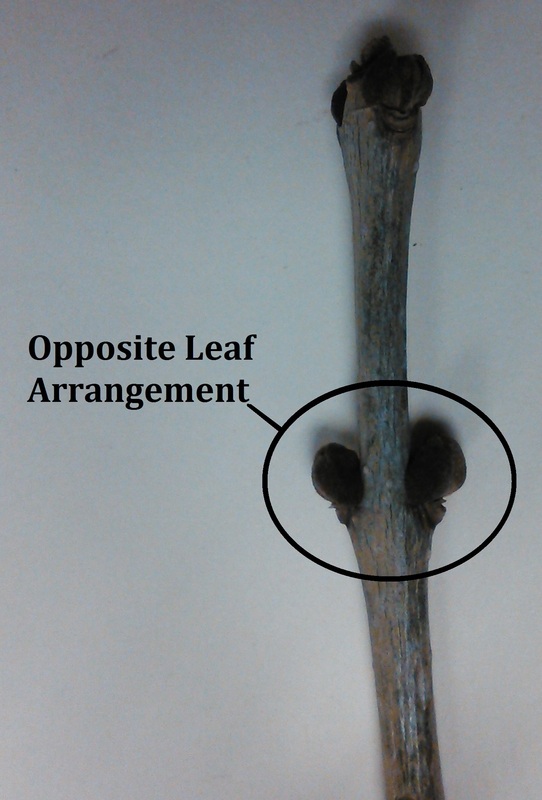 Black walnuts have alternate leaf arrangement with a large terminal bud. The buds are fuzzy and light gray in color. The leaf scar is large compared to the bud. The pith (spongy tissue in the center of the stem) is distinctly chambered. This can be seen by carefully taking a sharp blade and cutting the stem in half, as shown in the image below. Learn more about identifying winter trees in the Winter Tree Identification Part II: Evergreen Trees and Winter Greens blogs. Post and photos by Lilly Schelling. Thank you for the sharp photos and clear explanations!